Heat a Dutch oven or heavy oven-proof pot over medium heat. Cook and stir pork in the hot skillet until browned and crumbly, 5 to 7 minutes. Stir onion, garlic, salt, cayenne pepper, and black pepper into pork; cook until onions are translucent, 5 to 10 minutes. Mix baked beans, 1 cup barbeque sauce, raisins, and Worcestershire sauce into pork mixture. Whisk baking mix, buttermilk, and egg together in a bowl until smooth; pour evenly over pork mixture. Bake in the preheated oven until biscuit topping is golden brown, 40 to 45 minutes. 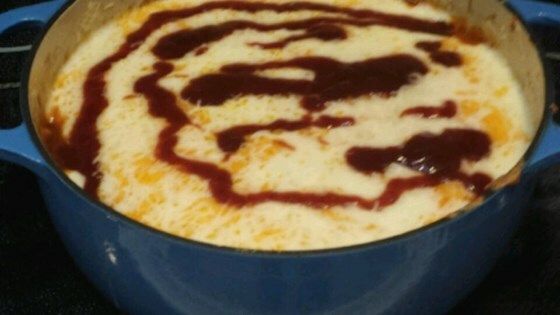 Sprinkle Cheddar cheese and mozzarella cheese over topping and drizzle 1 tablespoon barbeque sauce over cheese. Bake until cheese is melted, 3 to 5 minutes. Simple & delicious. Couldn't find ground pork, so chopped pork sirloin. Otherwise followed recipe exactly & entire family loved it. Good thing I doubled the recipe!